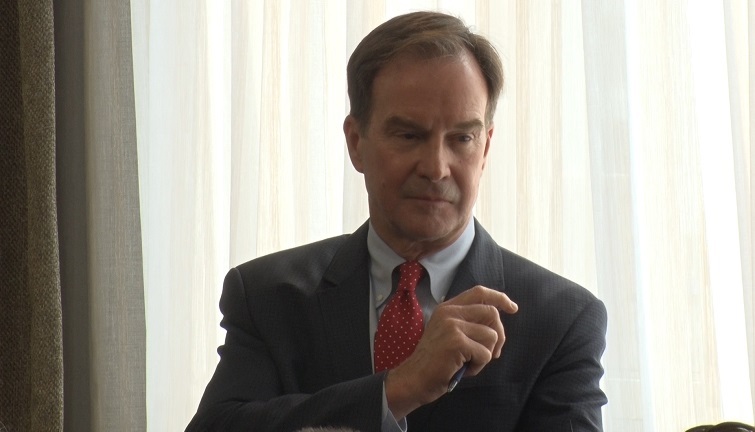 MARQUETTE — With a round of applause from the crowd, Michigan Attorney General Bill Schuette walked into a room filled with business leaders and key stakeholders at the Staybridge Suites of Marquette Monday afternoon for a roundtable discussion. Two weeks ago, Schuette announced in his hometown of Midland he called the worst kept secret in America: he is running to become the next governor of the State of Michigan. At the luncheon, Schuette talked heavily about the economic agenda he would push as governor, including the elimination of an income tax and tackling auto insurance reform. People who attended the meeting had the opportunity to speak with Michigan’s current attorney general about issues that are unique to the U.P., from energy prices, the status of Line 5, and more. The 63-year-old Schuette has served in various forms of public office for 27 years and counting. He’s been Michigan’s Attorney General since 2011. Schuette’s stop in Marquette is part of a 30-stop listening tour throughout the state in 10 days.